But I must admit, I’m finding it almost unsettling to have a “due” date that isn’t really set in stone. It’s a blurry due date. That doesn’t really work well with me. My cable bill is due on the 14th. My electric bill is due on the 27th. A project at work is due by 8:00 am on Monday. Wow, that’s a very impressive nursery! Due dates are funny. Our first went 6 days past (longest six days of our life). Our second was 2 weeks early. So it’s a crapshoot. But even if you think you’re ready, you’re not. Impressive? You think so? Thanks! I’m most proud of the paint job which was inspired entirely by the backgrounds in Super Mario Bros and Super Mario Bros 2. We intended to draw eyes on the clouds like they have in the games but never actually got around to it. The funny part is that the paint job and the giant leaves have been up for years. That was actually the “grown-up” bedroom until about a year ago. Don’t laugh — swap out the crib for a queen size bed and it made for a great bedroom. 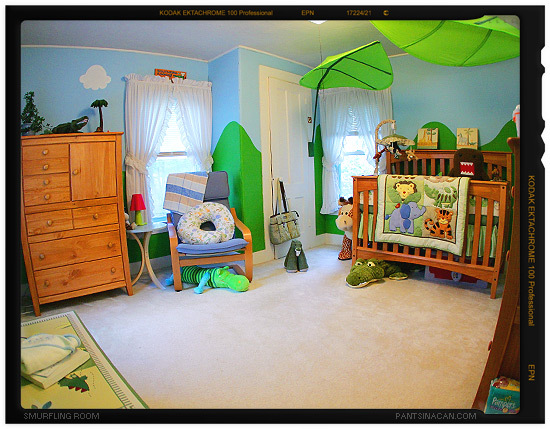 What a beautiful nursery you and your wife have put together. I love that you have given it a Mario brothers theme. LOL! Love the bedroom! I would have thought it was a magazine ad. As a mom of 2 young kids, I have one recommendation though – move the throw rug closer to the crib. Like, right up against it. If you have a baby who’s into projectile vomiting (as one of mine was) it is a lot easier to deal with when you know it’s on a rug you can toss in a couple of years, versus on the carpet that you plan to keep as long as possible. Just found your website last week, and I’m loving it! 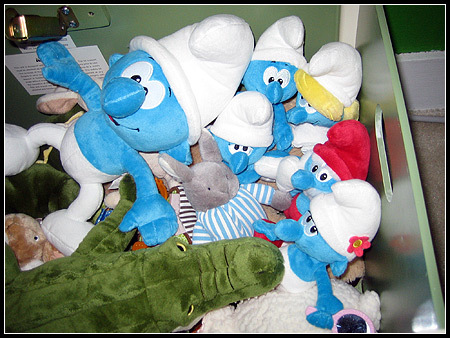 The smurf thing cracks me up – my oldest will be 6 on Friday and we’ve called him Smurfy and Smurf-boy since the day he was born. Thanks for the tip Angie! And a real nice blemish might just be the spark we need to get a nice new (and more practical coloured) carpet installed! Awesome room you have set up, Smurf! All I can say is don’t worry about the due date. After the little smurfling comes, that will be the least of your worries! Good luck! You’ll love the experience. That room really looks awesome! That’s one lucky little smurf! Awesome room! Love the stuffed domo! But where are all the 80s Smurf decorations??? @Dustin — Yeah, when I saw that Domo, I knew I had to buy it! I’ve found that most of the baby stuff out there is kinda wimpy so, at the very least, I wanted a few things with sharp teeth in the room to toughen the little guy up. @Heather — Most of them are hiding in the toy box on the left (which I think Angie mistook for a throw rug — but now we’re in the market for one of those too!) with a bunch of alligators, a sheep type thing, and the Goodnight Moon rabbit.